Campus CEO Tom Currier has just announced that his fast-growing housing startup will be dissolving, putting in jeopardy its upwards of 150 San Francisco and New York City residents from roughly 30 co-living houses. Campus, which SFist examined in January, was something of a corporate co-op. Acting as a property management group while espousing the ethos and principles of co-living, Campus offered newly-renovated rooms on a monthly basis for roughly $1,000 to $2,200. It's unclear what owners will choose to do with their properties. Houses in neighborhoods like the Mission received professional cleaning courtesy of Campus, and house events were hosted and managed by a team of Campus employees. Each location came with a hot-tub, and Campus "members" were granted access to wine country and Tahoe vacation homes. 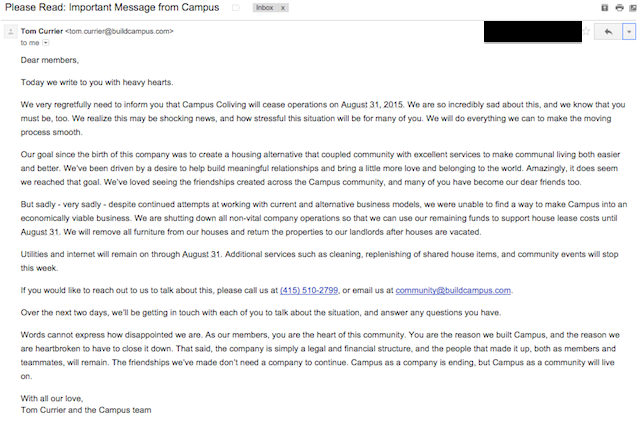 "We very regretfully announce that Campus Coliving will cease operations on August 31, 2015," reads the note that now replaces Campus' website. Just hours ago, the site was full of promising images of cheery, pristine living spaces targeted at young, like-minded city newcomers, many of them in the tech industry. "Despite continued attempts to alter the company’s current business model and explore alternative ones, we were unable to make Campus into an economically viable business." Currier's company grew out of his experiences co-living after he left his own campus, Stanford, with $100,000 but as yet no degree when he was selected as a Thiel Fellow. In January, as campus was growing quickly and considering a name change to attract a wider audience, one resident, Jordan Bennett, glowed when asked to share her experience. "It's a little nerve racking to move to a new city," she explained, "so to come to San Francisco and have a community that was already set up made me feel more comfortable making the move, and I've met people that I would have never met otherwise." Currier also used some of the above wording in a letter to Campus members who now face the difficult decision of how and where to move. Through an anonymous tip, SFist obtained the full break-up letter to residents, which is below.